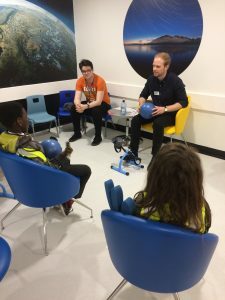 Pupils from Hazel Community Primary School in Leicester had the opportunity to ‘think and act like scientists’ in Research Space at Leicester’s Hospitals to celebrate International Clinical Trials Day on 23 May. Normally Research Space is closed to visitors while clinical trials are taking place. However, in a break from the norm, 60 children from Year 4 took part in scientific experiments and had a tour of the facilities. Activities included using red cabbage indicator to test different household substances to see if they were acidic or alkaline, and learning through trial and error by building towers using only marshmallows and dry spaghetti. Christina Daines, children’s research manager at Leicester’s Hospitals, said: “The aim of this event is to inspire the next generation of scientists, doctors and research nurses. The National Curriculum encourages children to ‘think scientifically’ so all our activities today were based around real life research techniques such as problem-solving, trial and error, using observational skills and recording results. After each activity the children collected a sticker to add to their Research Passport. Research Space is a dedicated clinical trials facility based at Leicester Royal Infirmary. It is split into separate clinical areas for adults and children. The children’s facility, which was launched last year, is a bright and welcoming space-themed environment to help children and young people involved in research feel calm and relaxed. The facility was funded by Leicester Hospitals Charity, HSBC and through donations by trusts and members of the public. International Clinical Trials (ICT) Day is an annual event held on or close to 20 May. The date was chosen in recognition of James Lind, a naval surgeon who conducted the first recorded clinical trial on 20 May 1747.